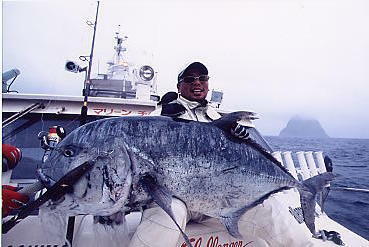 During its development, a massive Monster Giant Trevally was landed. 158cm, 53kg. Please be advised that it will take a little while longer to be ready for sale. ■Please note that prices and product specifications listed on this Home Page may be subject to changes. ■Please note that the colors of the product may be slightly different from what is presented in this Home Page. (c) copyright, 2003-2007 hammer-head. all rights reserved.